Though embraced by the likes of Glenn Beck, Thomas Paine was the American Revolution's most radical figure. "Thomas Paine" by Laurent Dabos. When Thomas Paine passed away at his small farm in New Rochelle, New York in 1809, he was impoverished and largely reviled. In the United States, then undergoing a dramatic religious revival, he was slandered as an “infidel” and a “drunk” for his attacks on Christianity and his rumored personal moral depravity. This, on top of his tirades against George Washington, the Federalists, and slavery, had decimated his reputation in the country he helped found. Across the Atlantic, Paine was condemned as a traitor to the Crown and a dangerous rabble-rouser for his passionate defense of the French Revolution in The Rights of Man , convicted in absentia for seditious libel, and burned in effigy throughout Britain. No single person was seen as a greater threat to the political establishments of his day than Paine, both in the monarchies of Europe and in his own American Republic. As a cult of personality around the “Founding Fathers” grew over the course of US history, the author of Common Sense was notably excluded. For about two hundred years, Paine’s image in mainstream American circles was utterly tarnished: Teddy Roosevelt’s view of him as a “filthy little atheist” sums up the prevailing sentiment. It’s no surprise that decades earlier Abraham Lincoln kept his admiration of Paine quiet. Nonetheless, interest in Paine spiked during periods of crisis and democratic upheaval in the 1930s and again in the 1960s, and things changed when Ronald Reagan, in his 1980 acceptance speech for the Republican Party’s nomination for president, quoted the great revolutionary’s inspiring promise, “We have it our power to begin the world over again.” Since then, Paine has been readmitted into the lineup of US founders, and has recently been made the unlikely poster boy of the reactionary right, most notably by media personality Glenn Beck. Unlikely, because Paine was a consistent advocate of a strong federal government and also a sharp critic of economic inequality and poverty who designed the world’s first fully fleshed-out scheme of social welfare provision. Beyond that, he introduced millions to a radical critique of private property and class society, and pointed to democratic politics as the solution. Over the course of the nineteenth century, while ruling classes were cursing Paine’s name from pulpits and palaces, the growing radical workers’ movements were toasting to his memory and reprinting his works. The Irish Republicans, the Chartists of England, and the early American labor movement all lauded Paine and his ideas echoed across Europe in the Revolutions of 1848. For generations, the revolutionary’s birthday was celebrated every January 29 by fledgling trade union and socialist movements on both sides of the Atlantic, who regarded Paine as one of their intellectual fathers and a role model for democratic revolutionaries. The Prussian Forty-Eighter, disciple of Karl Marx, and Civil War Union Army Gen. August Willich praised Paine’s radical criticisms of authority at dozens of the birthday celebrations held by radical German-American organizations. Eugene Debs too was an open Painite, and at his trial for sedition for publicly opposing World War I, he cited Paine’s declaration, “My country is the world. To do good is my religion” as a model of the “wider patriotism” that he espoused. Not only was he a central personality in the “age of revolutions,” he was one of the first radicals to connect the cause of political democracy to economic demands. Because of that, he was touted as a champion not only of the rights of the commoners against aristocracy, but, as Eric Hobsbawm put it, “the radical-democratic aspirations of small artisans and pauperized craftsmen” against the owners of property. 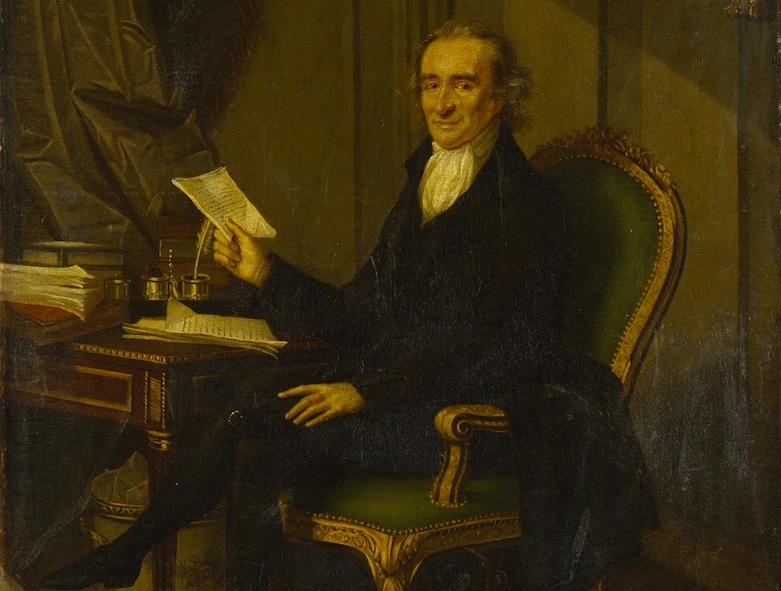 Thomas Paine’s early life taught him to preach rebellion against inequality. He was born on January 29, 1737, in a small town called Thetford in the east of England to a humble Quaker family. His father trained him in the family craft — staymaking — though he ran away from home at age sixteen. On his own, Paine found work as a journeyman, a tax collector, or a teacher; went through two marriages (the first soon left him a widower, and the second ended in separation); lived mostly on poverty wages; and had a difficult time holding a job for any extended period of time. His first foray into politics found him leading his fellow tax collectors in a doomed campaign for higher pay. The first half of Paine’s life, as historian Eric Foner put it, was a “period of unrelenting failure,” and grounded his lifelong identification with the plight — and resilience — of poor and working people. In the 1770s, he fell in with circles of religious Dissenters and radical craftsmen in the London area and Lewes, and he developed an interest in science, technology, deism, and political philosophy. Through this dissident milieu he met Benjamin Franklin, who in 1774 encouraged Paine to immigrate to America and wrote him a letter of recommendation. On his arrival in Philadelphia, Paine quickly found a place in the community of radical craftsmen there, becoming editor of the Pennsylvania Magazine . He earned a name for himself as an articulate voice of political dissent, though he used pseudonyms for his more controversial articles. The American Revolution, however, soon overshadowed this early work. As military tensions were flaring up between the British and the colonists, Benjamin Rush suggested Paine write a pamphlet in support of independence from Britain and republican government, though advising him to avoid inflammatory words. Paine agreed to write the work, but ignored the advice to tone down the language. Whereas previous anti-British pamphlets had used dry, legalistic language, citing precedents and past authorities, Paine deliberately avoided “every literary ornament” and crafted his message with “nothing more than simple facts, plain arguments, and common sense.” Not only did Paine’s work reach a much broader audience than previous attempts had, inspiring many to revolt, he succeeded in changing the very language of politics itself. Before Paine’s writing, the word “republic” was commonly associated with mob rule and anarchy in mainstream discussion. After Common Sense had soaked through colonial society, a republic seemed to be the only just form of government. After all: “Of more worth is one honest man to society . . . than all the crowned ruffians that ever lived.” Paine’s work was crucial in winning over many to the cause of independence and republican government. As Common Sense made the rounds, Paine took part in the political revolution in the province of Pennsylvania. As the old provincial assembly was continuing to favor reconciliation with the British, Paine and other radicals attacked the body as illegitimate on the grounds that its electorate had been restricted to property-owners. After ousting the old landed elite from power, the radicals called a popular provincial convention, which approved a new state constitution that featured a unicameral legislature based on universal male suffrage — allowing even indentured servants to vote — with one-year terms for office. This was by far the most democratic constitution of the time. Paine took its unicameralism, its short office terms, and its universal male suffrage as the ideal against which he would criticize all other constitutions throughout his life, including those of the United States and France. But Paine condemned in the harshest language the Federalists themselves, describing the Federalist Papers as “despotic” and saying of John Adams, “his head was as full of kings, queens, and knaves, as a pack of cards.” The Federalists’ fears of the tyranny of the majority could not clash more with Paine’s vision of popular sovereignty as the solution to all problems, and view that institutional checks placed on the people’s will was an aristocratic threat to liberty. Paine took his unshakeable faith in democratic government with him when he traveled to Europe in 1787. A student of science, Paine had designed an innovative iron bridge he hoped to build over the Schuykill River in Philadelphia, and he set forth for England with the simple purpose of finding investors for it. He had made a lot of powerful friends in the course of the Revolution, and the state of New York had gifted him a small farm seized from a loyalist, but Paine had donated all royalties from his publications to the cause of the young nation, and he could not finance his bridge’s construction on his own. And so Paine stumbled to Europe, accidentally finding himself at the center of a new wave of revolutionary upheaval following the storming of the Bastille in France. The United States that Paine had left was still an overwhelmingly agrarian society. By contrast, England in 1787 was in the early stages of the industrial revolution. While enchanted by the possibilities of industrialization, Paine also noted the monstrous social inequality that accompanied it. After returning to London, Paine published Rights of Man , which laid out both a principled defense of the French Revolution and a damning criticism of the English monarchy and the aristocratic social system. The publication quickly sold thousands of copies, and he soon began work on a second part, which would mark a crucial development in his writing. Rights of Man Part II goes beyond the critique of hereditary government and defense of political democracy seen in Common Sense and the first part of Rights of Man . Intended for the poor and working people of Britain, Part II specifically attacks social class and calls for not only republican government but also an elaborate system of social welfare provision. Despite his observation that “a great portion of mankind, in what are called civilized countries, are in a state of poverty and wretchedness” which was “far below” that of preindustrial societies, he did not wish to return to simple rural life as did philosophers like Rousseau. Rather, he wished to eliminate the evils of modern commercial life while maintaining its benefits. To that end, Paine proposes not only the abolition of feudal privileges but also the introduction of large taxes on luxury goods and inheritances, and the use of the funds raised to pay for an elaborate welfare state. This would include direct welfare payments to the poor, public education for all children, old age pensions, income support for families with newborn children, and aid for funeral expenses. This is not only a remarkably advanced welfare system for 1792 — it’s astonishing in its complete rejection of the sorts of paternalism that have so often accompanied later schemes of social relief. Paine saw reliance on charity and the Poor Laws as inadequate and humiliating. In his system, all the programs are universal, with no strings attached, and are “rights” that can be demanded. For Paine, the cause of political democracy is inseparable from the economic demands of the poor, and the solution is democratic government: the poor can escape their wretched condition only through politics. Rights of Man Part II sold roughly two hundred thousand copies that year, by far outselling any political pamphlet in history at that time. Its message quickly reverberated through the “lower orders” of British society, as well as the rest of Europe and North America. The revolutionary French government awarded Paine honorary French citizenship and, on his arrival in the country, he was elected as a representative to the Convention for Calais, arriving just in time to herald the abolition of the monarchy and the birth of a republic. Paine could not speak French, and was therefore cut off from his usual base of popular support and had to rely heavily on his friends like Condorcet to keep him in the loop. As a result, he had a great difficulty finding a place in French Revolutionary politics, and nearly lost his life because of it. Though Paine is sometimes mischaracterized as “among the most moderate of the Girondins,” he was in fact one of the most radical democrats in the Convention, and befriended members of both political factions, including Jacobin leader Georges Danton. Two things marked Paine for suspicion in Robespierre’s mind: his association with Girondins such as Condorcet and his advocacy that the deposed king be spared the death penalty. While Paine agreed that Louis Capet was guilty of high treason, he argued for the punishment of exile rather than execution. This position was based on a principled objection to the death penalty: “as France has been the first of European nations to abolish royalty, let her also be the first to abolish the punishment of death.” Paine convinced nearly half of the Assembly, but not quite enough. In January 1793, the king was sent to the guillotine. As the French Revolutionary War turned sour, Paris was riven by faction fighting, and the provinces were engulfed by peasant uprisings, Paine withdrew from the Convention in disaffection. At the end of 1793, Robespierre came to power and Paine was arrested along with everyone else associated with the Girondins. After riding out the Reign of Terror in Luxembourg Prison, Paine managed to avoid the guillotine by a fluke accident and, after the fall of Robespierre and the rise of the Directory, was finally released due to the intervention of the new American ambassador, James Monroe. He lived with the Monroes for the next few years. Though still recovering his health, he stayed tuned in to political developments in the country and followed intently the crackdown against the Conspiracy of Equals, a group of ex-Jacobins aiming at the violent overthrow of the Directory, and the trial and execution of their leader, Gracchus Babeuf. Their thought would have a large influence on Paine. The “Babouvistes,” as they were known, were the first modern revolutionary communist movement, and their assault on property was far more radical than anything Paine or other radicals had put forward. Taking the political theory of Rousseau in a radical new direction, they argued, “miseries and slavery are consequences of inequality, which is itself the result of property. Property is, therefore, the greatest scourge on society; it is a veritable public crime.” All differences in wealth are unearned — they accrue by the exploitation of others, or by the accident of naturally endowed strengths and talents — and therefore are undeserved. The Babouvistes proposed a new Reign of Terror during which they would nationalize all private property, impose equal liability to work and provide an equal distribution of goods to each citizen. This plan was popular with the Parisian sans-cullottes, though many balked at the conspirators’ bloodlust. Speaking in the same radical democratic republican language as Paine, the Babouvistes came to a much more fundamental critique of property and a wholly collectivist solution. Though the Conspiracy was discovered and its leaders arrested, the movement’s doctrine left a deep impression on Paine. His Agrarian Justice , written in 1795–96, was Paine’s last great pamphlet and marked the completion of the social welfare project he had proposed in Philadelphia in 1775. The pamphlet reiterates in clear language Paine’s theory that inequality and poverty arise not from nature but from society. More clearly than in Rights of Man Part II , and plainly inspired by the Babouvistes, he traces the origins of this inequality to private property. Crucially, the cause of inequality in Agrarian Justice is no longer linked to an “aristocratic” system of privileges, as in all his previous works, but to the very institution of property itself. He explains that such private property is justified because cultivation so greatly increases the productivity of the soil, but that in “all those who have been thrown out of their natural inheritance by the introduction of the system of landed property” are owed compensation for that loss by right. The money raised by this ground rent would be distributed out as an equal payment to “every person, rich or poor” on turning twenty-one, guaranteeing to each citizen a modest inheritance, “means to prevent their becoming poor.” This proposal has often been interpreted as the first suggestion for a universal basic income, but that doesn’t seem to be exactly what Paine had in mind. While a basic income is usually seen as an anti-poverty measure designed to help the poor meet their living expenses with regular cash payments, Paine’s proposal takes the form of a one-time lump-sum grant given to each individual when they reach adulthood. He goes on to say, “With this aid they could buy a cow, and implements to cultivate a few acres of land; and [work for themselves] instead of becoming burdens upon society.” Paine hopes that recipients will use their social inheritance not to buy consumption goods, but to buy for themselves some means of production, and avoid entirely the precarious and pauperized life of wage labor. This is a universal capital grant, not a basic income. Paine wants to make everyone the owner of productive property. Republican liberty, after all, requires economic independence and material security for everyone. But in devising this scheme, Paine goes beyond, and contradicts, his initial claim to deal exclusively with “natural property.” The ground-rent he proposes would take the form of a 10 percent inheritance tax on all estates. The value of these inheritances, he realizes, includes “what is called personal, as well as . . . landed property,” and there is no clear way of parsing out the two. Personal property is the effect of society; and it is as impossible for an individual to acquire personal property without the aid of society, as it is for him to make land originally. Separate an individual from society, and give him an island or a continent to possess, and he cannot acquire personal property. He cannot be rich. So inseparably are the means connected with the end, in all cases, that where the former do not exist the latter cannot be obtained. All accumulation, therefore, of personal property, beyond what a man’s own hands produce, is derived to him by living in society; and he owes on every principle of justice, of gratitude, and of civilization, a part of that accumulation back again to society from whence the whole came. Paine’s second criticism is equally profound: “if we examine the case minutely it will be found that the accumulation of personal property is, in many instances, the effect of paying too little for the labour that produced it; the consequence of which is, that the working hand perishes in old age, and the employer abounds in affluence.” Here Paine sees property to be the result of the exploitation of labor by capital. Given the depth of Paine’s criticism of the principles of private property, it is unclear why he is so devoted to defending a reformed version of the institution. It is clear that he sees “landed monopoly” as inseparably linked to “cultivation . . . one of the greatest natural improvements ever made by human invention,” and in his system he seeks to “remedy the evils and preserve the benefits” of the modern system. But he seems to contradict himself in two respects: first, he seeks to preserve the benefits of large-scale cultivation and production, but his capital grant proposal has the aim of offering an escape from wage labor in large-scale cultivation and production; and second, he wants to create a system in which everyone appropriates the full products of their labor, but offers a profound criticism of the very idea of the right to “the full products of one’s labor.” The question remains: why not communism? Modern socialists no doubt will see the specific form of Paine’s solution as insufficient. But he was, after all, writing at a time in which modern class antagonisms were “only just cropping up,” and which could then be thought of only “in their earliest, indistinct and undefined forms,” as Marx later said in defense of a different group of early socialist thinkers, who wrote in the decades after Paine. It was quite reasonable to propose small proprietorship and commerce as a solution to inequality in the 1790s, even if we see that same solution as thoroughly obsolete today. We should not overlook the significance of Paine’s fundamental critique of the regime of private property and his insistence that the political revolution must be followed by a social revolution that transforms those property relations. The American revolutionary’s formula was groundbreaking: exploitation and inequality are the disease, and democratic politics is the remedy. This message reached hundreds of thousands of poor working people in a time when the Industrial Revolution had only just begun. The connection between Thomas Paine’s writing and Karl Marx’s politics isn’t simply one of an abstract resemblance. Most prominent socialist theorists of Marx’s day were consistently apolitical or anti-political: some, like Robert Owen and Charles Fourier, advocated the withdrawal from society into utopian communes; others, like Henri de Saint-Simon, offered technocratic schemes to existing governments; still others, like Pierre-Joseph Proudhon, called for working-class mutual aid societies and total abstinence from politics. Against these socialists, Marx advanced a revolutionary politics inspired by the political activities of two national trade union movements: the Chartists in Britain and the Workingmen’s movement in the United States, both of which were thoroughly Painite. In Britain, the growing trade union movement of the early nineteenth century closely linked its economic demands and strike activity with the demand for the right to vote and political democracy. Friedrich Engels, witnessing firsthand the strike wave of 1842 at his father’s factory in Manchester, became an enthusiastic supporter of the People’s Charter and wrote several pieces about the promise of these Painite, working-class democrats that Marx published in the Rheinische Zeitung and the Deutsch-Französische Jahrbücher . The activities of the Chartists, as well as the French radicals of his day, served as Marx’s model for working-class politics under authoritarian regimes: the struggle for political democracy, republican government, and universal suffrage. In the Northern United States, property qualifications were removed from the right to vote in the late 1820s as part of the Jacksonian reform movement. Taking advantage of their newly won suffrage, Painite trade unionists in Philadelphia founded the Workingmen’s Party (the “Workies”) in 1828, the first labor party in world history, to compete against what they saw as the two parties of capital. One of the leaders of the New York Workingmen’s Party, Thomas Skidmore, the next year wrote Rights of Man to Property! , a book that took Paine’s argument in Agrarian Justice to a much more radical conclusion. Skidmore’s platform called for a statewide convention that would seize all private property in the state of New York and reapportion it equally to each resident. This Worky leader seems to be the first figure in history to voice something close to the exclamation “expropriate the expropriators” — and did so in a tract whose title is a deliberate nod to Paine’s Rights of Man . Extending Paine’s egalitarianism, Skidmore argued for full citizenship and voting rights for every resident of New York, including blacks, American Indians, and women, and an equal share of property for everyone. This proposal and the considerable (though short-lived) electoral success of the Workingmen’s Parties provoked a wave of panic by the ruling classes across the United States. Two accounts of this movement, one by Scottish aristocrat Thomas Hamilton and another by English Jacobin-turned-South Carolina slavery apologist Thomas Cooper, both found their way onto the reading list of Karl Marx during his formative years in the mid 1840s. Reading these hysterical reports of the American Workies, which he referred to as the American “socialist democratic school,” undoubtedly helped to inspire Marx’s view of the working class as the agent of modern social revolution, the centrality of universal suffrage for the cause of socialism, and the need for a mass-based political party of labor as the democratic vehicle to achieve that revolution. While Marx didn’t engage much with the works of Paine himself, the American revolutionary’s followers on both sides of the Atlantic played an enormous role in forging the nineteenth century’s workers movement that supplied Marx with the empirical politics that he provided a rich philosophical justification for. It’s no coincidence that he would write, “Socialism and communism did not emanate from Germany but from England, France and North America” — the same places where Paine had done so much to foment democratic revolution. Sean Monahan is an activist in the Democratic Socialists of America and studies political science at Brown University.